What is the most frequently asked question fielded by guitar teachers? Survey says... What scale do I use? There are hundreds of correct answers to that simple question. Some of those correct answers are also simple while some require a degree in higher math and rocket science to understand. Our mission as music students is to find the correct answers that click in our head and then proceed with our studies accordingly. Ultimately though, a proficient improviser is never thinking about scales or modes when they are playing. An accomplished musician is playing by a creative intuition that is fueled by that knowledge, but certainly not driven by that knowledge. Meanwhile, what scale do we use...? Jon Finn will not only answer that question in a simple and very illuminating way, he'll also guide your own creative intuition skills with a technique he calls Ear/Hand Coordination. 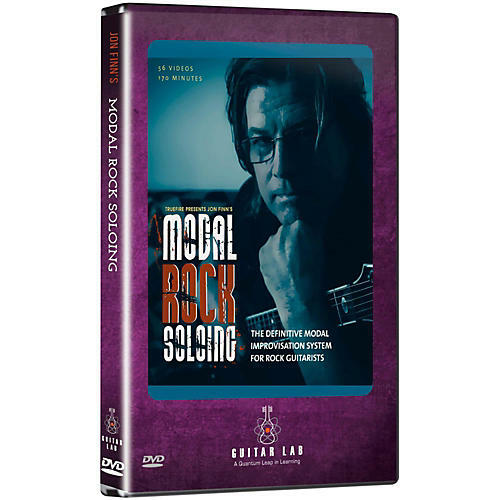 It's all here in Modal Rock Soloing. Guitar Labs innovative learning systems employ a hands-on approach where students play their way through the curriculum using learning tools such as PIP video, practice rhythm tracks, and interactive tab and notation, which allows the student to play along with the tab and notation, at any tempo, without change in pitch. A guitarist since age six, Jon Finn has been a professional musician for most of his life. Joining the guitar faculty at Berklee College of Music in Boston in 1988, he started the Jon Finn Group later that same year. To date, they have released three CDs internationally. For over three years, Jon wrote a monthly instructional feature for a national magazine called Guitar. Jon has also authored several books for Mel Bay Publications. In his freelance pursuits, hes played guitar for the national touring companies of many contemporary musical theater productions such as Rent, Aida, Mamma Mia, Grease, Joseph and the Amazing Technicolor Dreamcoat, Copacabana, and many others. Today Jon frequently performs and records with the Boston Pops Orchestra, and has been involved in a plethora of concerts and recording sessions, including 6 CDs (two of which were Grammy nominated), 8 US concert tours, and one tour in Asia.